The District Parents Advisory Council (DPAC) in Chilliwack, SD 33, has written to local MLAs, stating that parents are “exceedingly dissatisfied” and want their MLAs to advocate for increased public education funding. The Chilliwack DPAC has asked us to post the letter here as an example of DPAC advocacy, and they hope that other DPACs around the province will join them in advocating for better public education funding. The text of the letter follows; you can also find it in PDF form here. At our April 21st meeting, the Chilliwack District Parent Advisory Council (DPAC) voted unanimously in favour of initiating a district wide parent advocacy project. Our membership has grown significantly, and we have committed to spreading awareness regarding the negative impacts underfunding has had on the public school system in Chilliwack and throughout the province. Please accept this open letter as official notice that the Chilliwack DPAC is looking to you for support, as you represent the views of your constituents. Parents of public school students in Chilliwack make up a great portion of your constituents, and we are exceedingly dissatisfied. Many DPAC discussions throughout the year focus on the amount of time and effort PACs spend fundraising. Cuts to public education funding in BC have been on-going for more than a decade and PACs are expected by school administration and school board staff to simply fill the gaps. It is our belief that this is causing parents to disassociate from their school’s PAC, and ultimately be less involved in their children’s education. This is detrimental to students, parents, and the operation of the PAC, and will have long-term negative effects on society. Since districts were required by the provincial government to make “administrative cuts” in 2014/15 and again in 2015/16, Chilliwack operates with $1.3M less per year, increasing the pressure on parents to subsidize public education. Technology upgrade costs, specifically the Next Generation Network which was formally funded by the provincial government, have been downloaded onto the district. This cost the district $563,000 in the 2015/16 school year, $115,000 for the 2016/17 school year, and will become a regular line item, coming out of the already stripped operating budget. Bussing fees ranging from $215 – $350/student have been downloaded onto parents. Per pupil funding for students enrolled full-time is a paltry $7,158. It will increase by $8 for the 2016/17 school year; however, a $64 increase would be necessary to simply cover collective agreement increases. Thus, students will actually receive less. Custodial services have been drastically reduced; square footage of schools has increased by 78% since 1992, yet maintenance and custodial manpower has decreased. The only area of any school in the district that still gets cleaned as thoroughly and as frequently, are washrooms. No other areas can be kept up to previous standards. At the elementary level primary desks are only cleaned every second day and intermediate desks are only cleaned once a week. These desks double as eating tables for students, creating an opportune breeding ground for germs and bacteria. In 2014/15, staff replacement costs were upwards of $500,000. The district experienced a significant increase in absenteeism, particularly of support staff employees, likely due to low workplace morale and an ever increasing workload for those whose hours weren’t reduced. In anticipation of continued high absenteeism, it will be necessary to increase the replacement staff budget. When support staff employees are absent, the most vulnerable students go without support, negatively affecting the entire classroom. In addition to all of this, while BC is spending less on public education and communities are forced to close schools, $358M is going to fund private, independent schools. This is a gross misuse of public funds as these schools are exclusive and not accountable to the public. Clearly, underfunding of BC’s public education system is not a myth, and the low-hanging fruit has long been picked. School District 33 already saves money by participating in shared services, and they have reduced district staff personnel. Parents are asked to fundraise for playgrounds, library books, on-line math and reading programs, sports equipment, and even text books. Some PACs have even been asked to pay for water fountains, classroom fixtures, and carpet. Parent fundraising has gone way beyond enhancing students’ educational experiences, and in some cases is necessary to keep the school operational. This is unacceptable, especially to students attending schools in less affluent neighbourhoods where parents may be unable to contribute financially to fundraising. This creates a gap between have and have-not schools and means some students are not provided with the same resources and opportunities as their peers in neighbouring schools. …it is the goal of a democratic society to ensure that all its members receive an education that enables them to become literate, personally fulfilled and publicly useful, thereby increasing the strength and contributions to the health and stability of that society. If the government continues to reduce the amount allocated to public education in BC’s budget, it will soon become impossible to fulfill the British Columbia School Act mandate stated above. In addition, the School Act states that the PAC’s legislated purpose is to advise the board, principal and staff on any matter relating to the school. PAC constitutional duties include promoting parent involvement, educating parents on their rights within the school system, organizing community-building events, and contributing to the overall effectiveness of the school. However, the role of the PAC has shifted and because the focus is fundraising, the legislated purpose and constitutional duties of the PAC can no longer be fulfilled. Thus, the Chilliwack District Parent Advisory Council will continue to speak out against the chronic and unacceptable underfunding of public education in BC. It is time for public education funding to increase so that all students have access to quality education, and so that parents can return to their roles assisting and supporting students, and promoting the interests of public education. We ask that you join us in advocating for the public school students in Chilliwack, and lobby the provincial government for increased funding in order to provide an equitable education for all students in SD 33, and across the province. We thank you in advance for your much needed assistance in this important matter. This statement was made by MLA Dan Ashton and was analyzed by the CBC in its fact-checking segment; education minister Mike Bernier used the same wording in a different CBC interview. Presumably what this number refers to is the “total” line for the education budget (exclusive of capital spending), which is approximately $110 million more in 2016 than it was in 2015. What the MLA and the minister didn’t mention is that $48 million of that “extra” money is going to “independent” (private) schools and $36 million of it is going to “other partners” (eg, public libraries). When faced with pleas to save a school or program, provincial politicians often distance themselves by saying these are “local decisions” to be made by the boards. Yes, the difficult decisions regarding which schools to close and which programs to cut are made by the local school board, but the larger context cannot be ignored: the cuts are necessary because of provincial decisions. The provincial government controls the school boards’ funding and, to a large degree, the costs that boards face. Every time the province raises Hydro rates, MSP rates, ICBC rates, etc., and doesn’t increase education funding proportionately, that amounts to a cut to boards’ budgets. Additionally, the provincial government has a history of making spending decisions (for example, negotiating wage increases with employees, or constructing the Next Generation Network) and then pushing those costs onto the boards without increasing funding. The provincial pattern of downloading costs and not increasing funding is detailed in this letter written by School District 5 and this statement by School District 28. The Times Colonist quoted education minister Mike Bernier saying this on May 14, 2016. By that date, FACE already had 30 districts on our shortfall list, with a combined shortfall of over $84 million. The only thing unique about Vancouver and Saanich was that those trustees had put their foot down about making cuts to cover their shortfalls. Provincial politicians often cite “declining enrolment” as a reason that boards need to close schools or make cuts. This implies that enrolment growth would solve the problem. We will keep checking the education funding facts, because it is important for citizens to have correct information. Without context, background, and accuracy, numbers are essentially meaningless. For more context, questions, and answers, look here. Members of the Parent Advocacy Network for Public Education have put together a list of questions about the BC education budget for 2016. The document includes information and figures in context that will be very helpful to parents/citizens who have been hearing the government spin on education funding. VANCOUVER — Following the February 16 announcement of BC Budget 2016, and in anticipation of the Ministry of Education budget estimates being discussed in the Legislature, members of the Parent Advocacy Network for Public Education (PAN) have been examining the funding figures and have posed a number of questions about the K-12 education budget. Supporting this over-arching question are several detail-oriented questions that result from a close examination of the education funding figures. 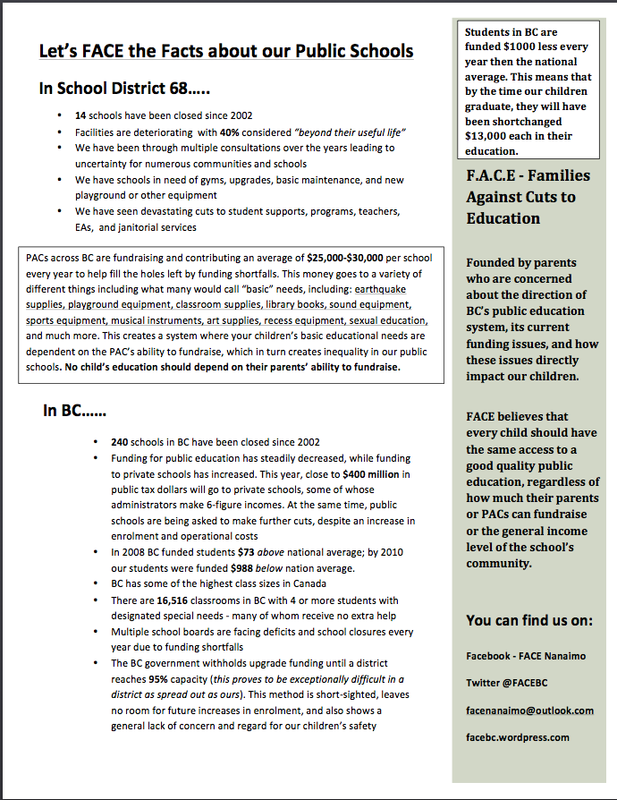 As citizens, parents, and taxpayers in British Columbia, PAN members are looking for answers to these questions in order to understand how funding is allocated to the school districts, independent (private) schools, and other partners. PAN has submitted these questions to the BC Liberal government, the NDP opposition, the Green Party, and the Independent MLAs in the Legislature, as well as to the media. PAN hopes to gain a better understanding of the budget details in the answers to these questions. PAN also hopes that by asking these questions, and prompting others to ask them too, some light will be shed on the stark reality that education funding in BC is inadequate. It is time to take action to put education back in the priority position it deserves. What’s Happening to Public Education in BC? 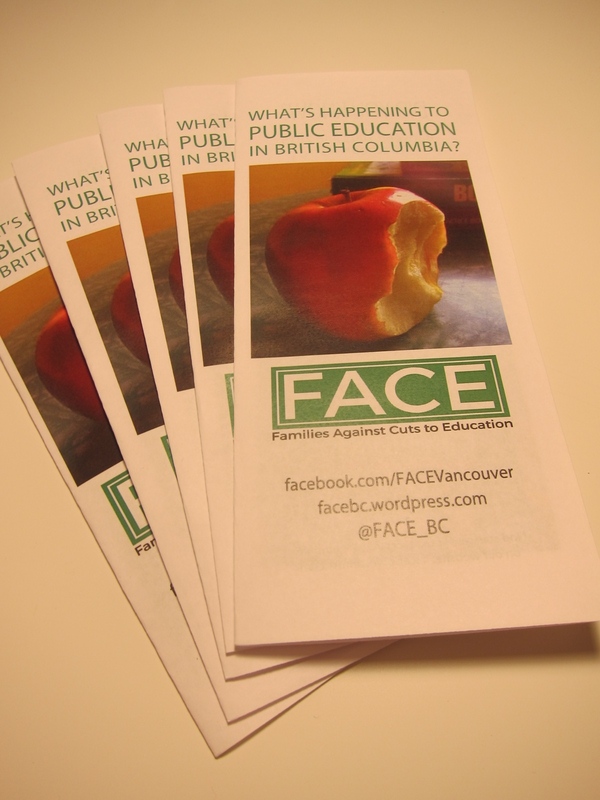 “What’s Happening to Public Education in BC?” is now updated for 2016: FACE Pamphlet March 2016. This pamphlet was created by FACE–Vancouver, but it contains information that applies across BC. Download it, print it, and pass it out! We also have a fact sheet with sources for the information in the pamphlet: EducationFacts-March2016. FACE–Nanaimo has created an information sheet that contains facts specific to School District 68 as well as province-wide funding facts. View it here (by clicking the photo on the right), or download the pdf: faceNanaimo. Put a face to the underfunding: news outlets like to be able to tell stories about specific people and their experiences. Find contact info on websites for newspapers, TV stations and radio stations. For example, CBC has its “Go Public” feature and some papers have education reporters, eg: Cheryl Rossi at the Vancouver Courier (@Cheryl_Rossi) and Tracy Sherlock at The Vancouver Sun (tsherlock@vancouversun.com). Find contact information for MLAs (your representatives in the provincial legislature), the premier, and the ministers of education and finance here. Tell them what you want them to do to improve public education. Tell other parents the facts about education budget cuts. Post the articles listed above on your PAC’s bulletin board. Download and post this information (pdf) and the FACE pamphlet (pdf) too.